Took me a while to figure this one out. 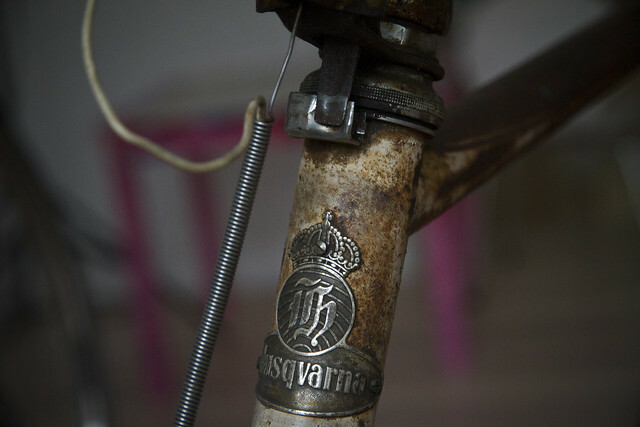 I've acquired a vintage, Swedish, Husqvarna bicycle from 1948. If you turn the handlebars quite far to the side, there is a little click sound. A friend of my Ivan enlightened me. It's a parking lock and it used to be standard on many bicycles back in the day. Like the lifting handle for Citizen Cyclists I've written about before. You have a kickstand and you park your bike. The front wheel will often fall towards the lean and that makes the bicycle less stable. With the simple parking lock it keeps the front wheel straight when parked. Simple design solution. Love it. Love it so much I made a film about it. Because it can be hard to explain what the hell it is I'm on about.